The dual cooling system offers the highest level of sample protection through the use of two independent refrigeration systems that maintain -86°C temperature. The two circuits work together for fast temperature recovery, while the secondary system keeps the temperature at -70°C if a service event occurs. 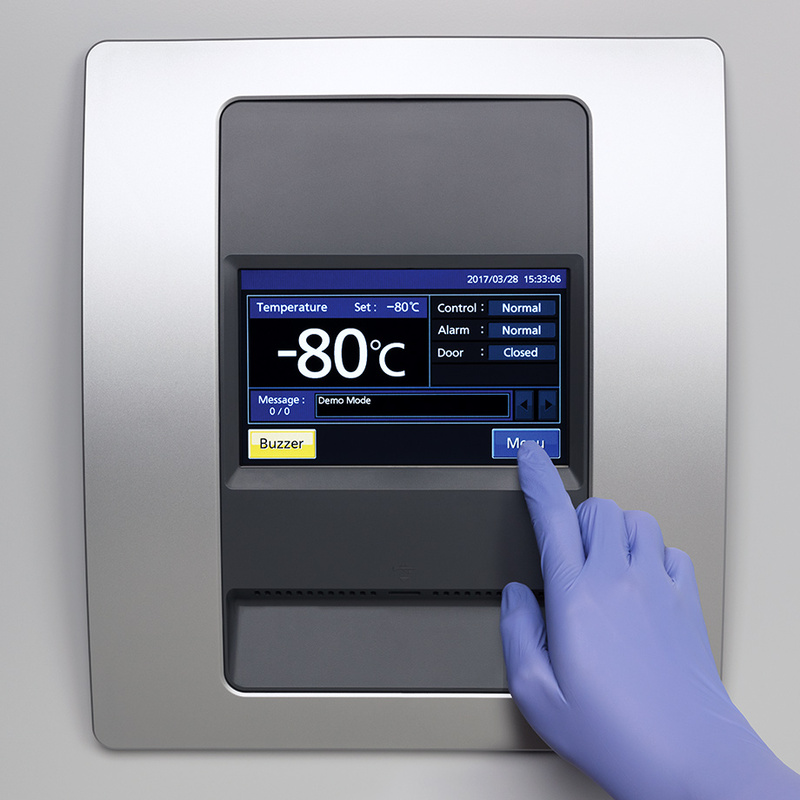 With two independent systems, each sustaining ultra-low temperatures, your samples remain safe. Optional CO2 backup provides and extra layer of protection. Redundant auto-cascade refrigeration systems unique to TwinGuard Series achieve superior temperature stability during initial startup and maintain uniformity following routine door openings and throughout the steady state. 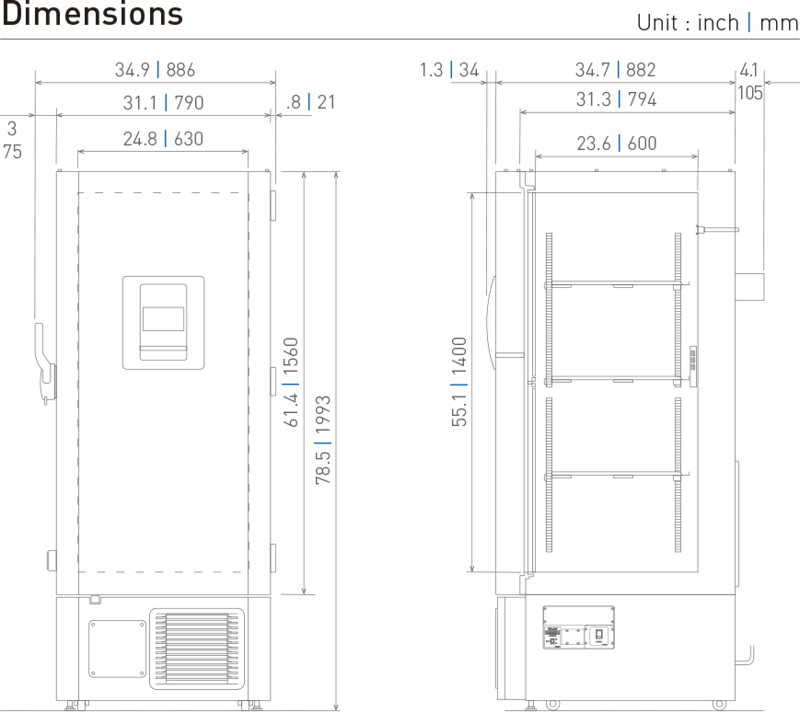 The cabinet and door insulation of TwinGuard Series ultra-low temperature freezers, are constructed using patented VIP Plus thin-profile vacuum insulation to maximize storage capacity and optimize use of floor space. This thin-wall composite insulation includes narrow-profile vacuum panel layers supported by foamed-in-place insulation. The highly efficient insulation also improves temperature stability following frequent door opening and extends warm-up times during power outages. 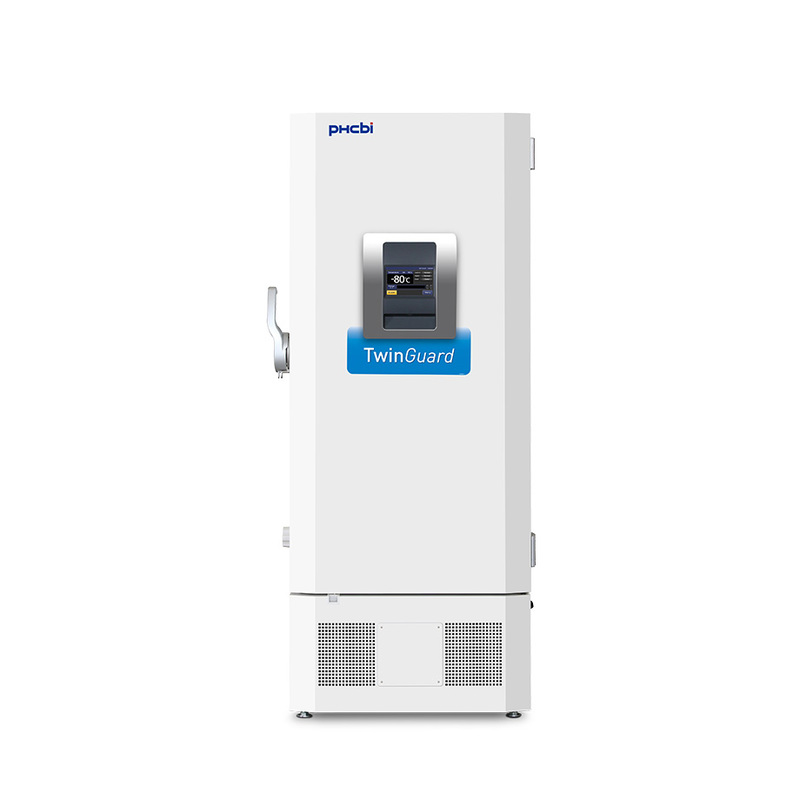 TwinGuard ultra-low temperature freezers are managed by a microprocessor-based controller that combines security, monitoring, predictive performance and data logging functions into a single display with password protected menu screens. TwinGuard Series freezers are designed and constructed for peak performance and reliability while maintaining efficient operating costs. An ECO mode provides additional energy savings. 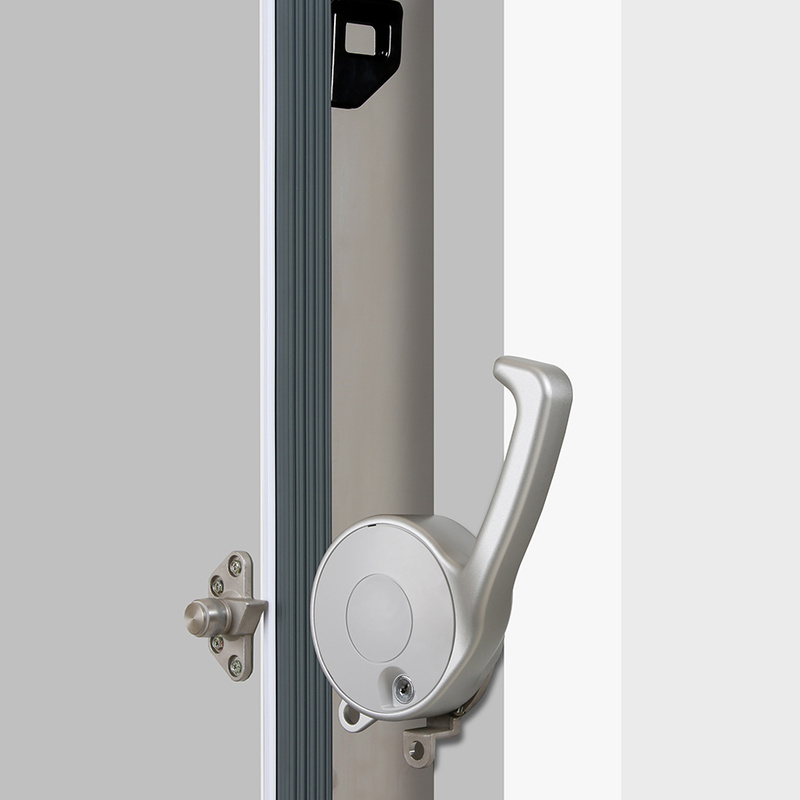 The patent pending EZlatch is engineered to tolerate frequent door openings, simplify one-handed access and control frost associated with extreme temperature differentials. 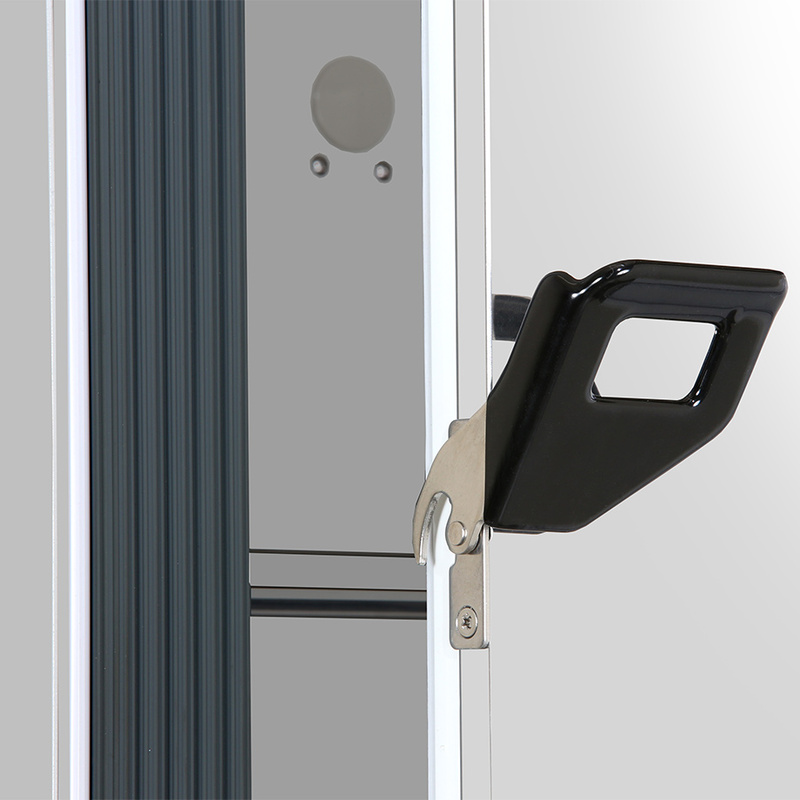 The EZlatch, one component of the Advanced Frost Control system, is ergonomically designed to ensure comfortable operation. 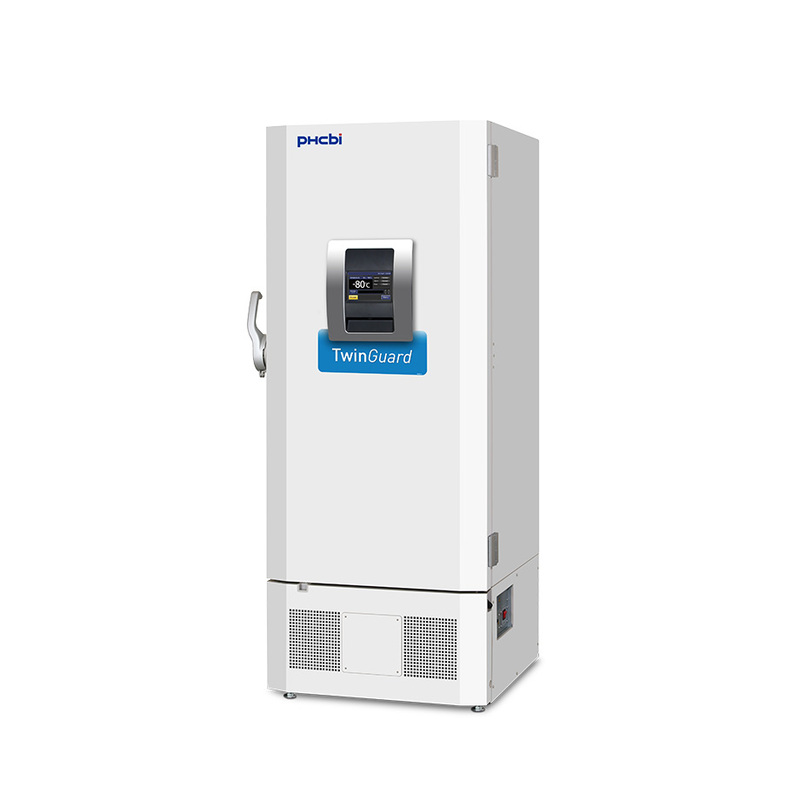 The Advanced Frost Control system in the TwinGuard series freezer model MDF-DU502VXC-PA combines an additional eight components specially engineered to enhance the performance envelope and ensure sample security, temperature integrity and frost control while extending freezer life. 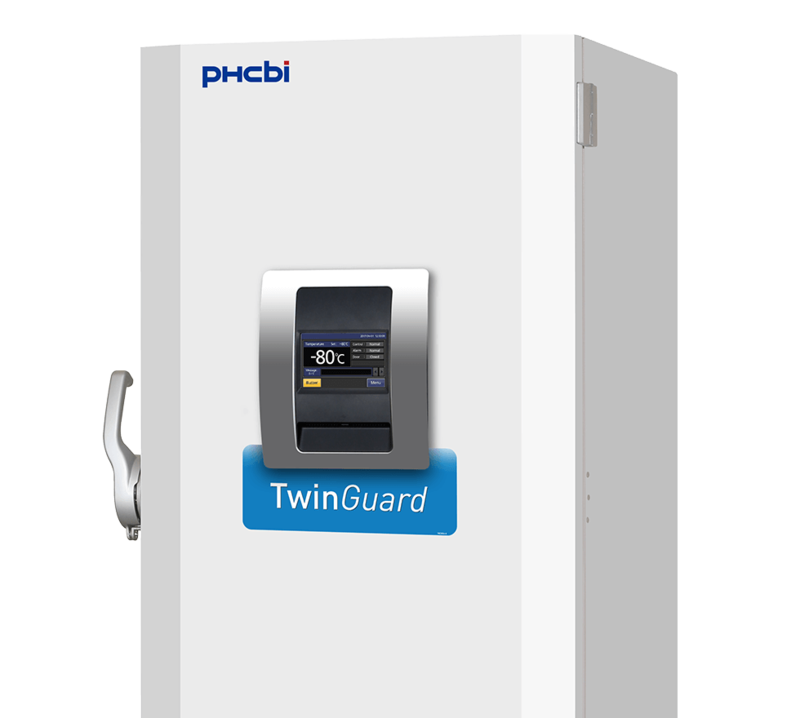 PHCbi TwinGuard Series upright and chest freezers provide twice the sample protection for double the peace of mind. Two independent refrigeration systems offer a circle of protection unmatched in the marketplace. Performance down to -86°C is based on integrated complementary refrigeration circuits, robust cabinet design and intuitive smart controls and monitoring. 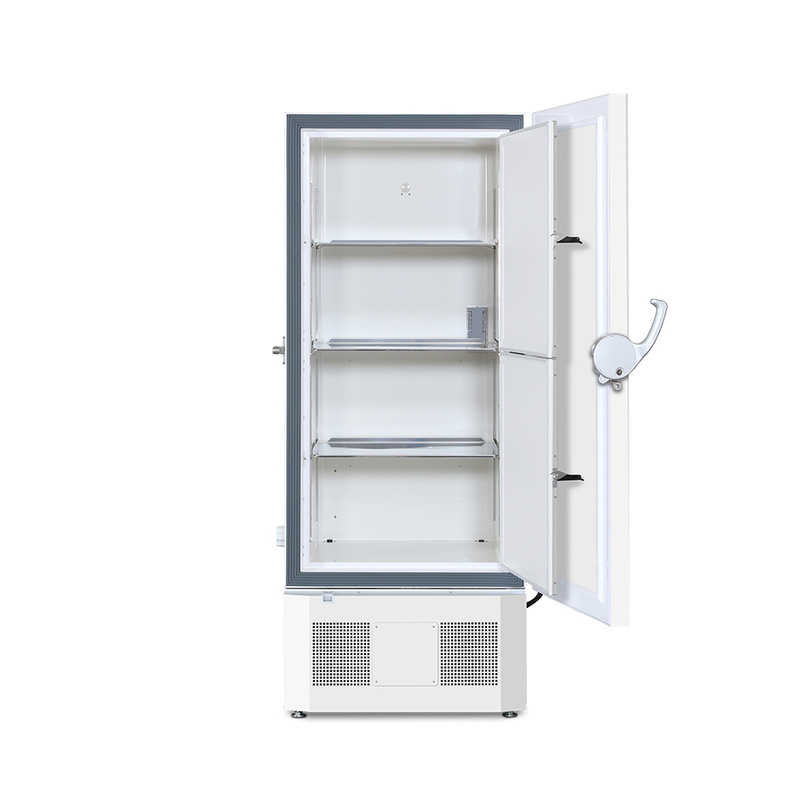 TwinGuard Series freezers are ideal for safe, long term storage of your most high valued products, such as stem cells, embryos, cell lines, rare specimens and other biological materials. 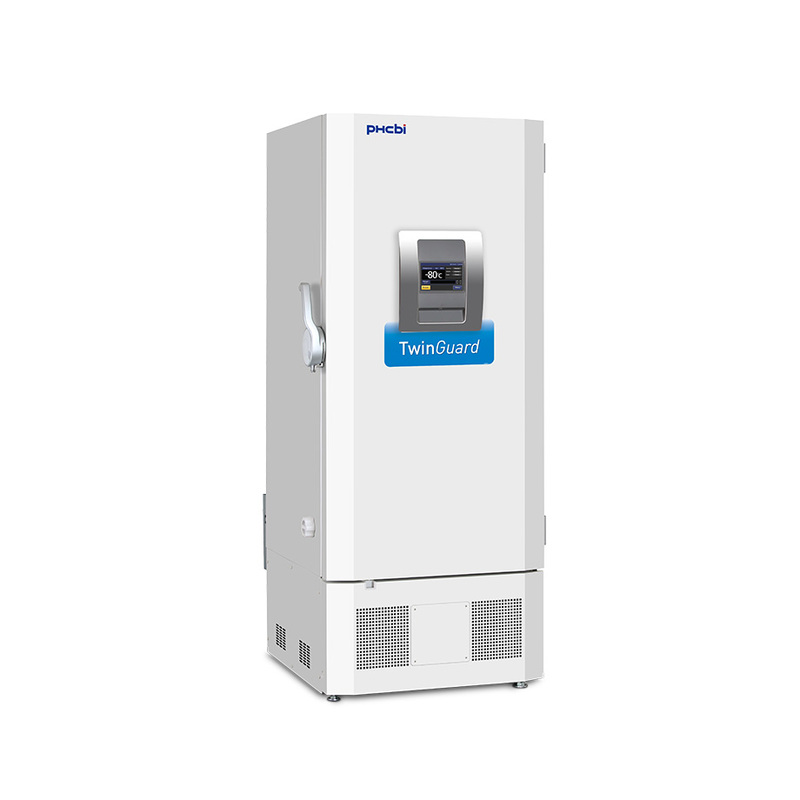 The MDF-DU502VXC-PA Ultra-Low Freezers provide ideal laboratory performance reliability, dual cooling system, and maximum storage.